Home » Canada » Was that a Jedi? Feeling the (Border Control) Force.. Since teleporters have yet to be invented, we were travelling from Glasgow to Calgary in the conventional way, by plane. My usual paranoia about missing the flight had set in and I had stayed up watching episodes of Firefly all night to ensure that we didn’t sleep in and miss the alarm clock. 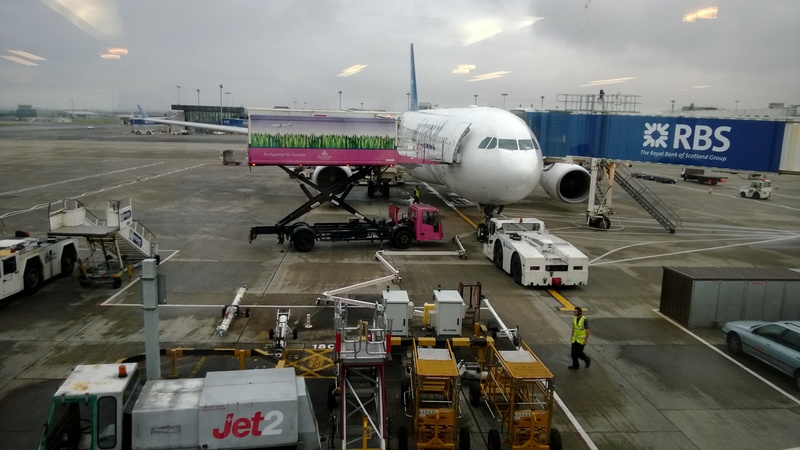 The flight was at 9.30am, which meant that we had to check in at 7.30am. Add to that the half hour drive to the airport and the hour to get showered and make sure that we had packed everything and it hardly seemed worthwhile going to bed. Arriving at the airport, I felt like a zombie but an excited zombie. A zombie that was going to Canada! When pre-booking our seats, we had booked two seats together on the inside row. The plane was set out in a 3-3-3 formation so regardless of where we chose, there would be one other person sharing our row. I had booked the aisle seat for Husband since, at over 6 feet tall, I thought he could use the spare legroom. In reality though, it was so he didn’t have to make small talk with the person sitting in the third seat in the row. ‘So I’m just your buffer then?’ I asked when he revealed this nugget of information. Can’t wait to get on the plane! Not that he needed to worry. Once we boarded, I soon realised that the person sitting next to me was just as keen to not have to make travel small talk. You know the kind of small talk I mean, the usual ‘where are you from’, ‘where are you going?’ ‘oh yes, do you have family there then?’. I tried to make eye contact and smile to say ‘I’m not a crazy person, you can talk to me and I won’t bore you to death with tales of my children or cats (since I have neither)’ but the woman (who was in her fifties) steadfastly refused to make eye contact. Sensing that the social pressure was off, I settled in and tried to relax. We were on the plane for 7 hours, not exactly a quick jaunt but not long enough to feel that you were trapped and would never again feel the earth under your feet. Books were brought out of our bags, snacks (non-smelly of course) were consumed and the tiny TV in the headrest was watched. I was very impressed to see that there were several episodes of Castle available to watch. Did the airline realise that Nathan Fillion was the most important Canadian sci-fi export since William Shatner or was it just a coincidence? Either way, it helped pass the time. Arriving in Calgary, we made our way through the airport. I love airports. The shiny corridors, the moving walkways that that are much slower than actually, you know, walking. There’s a build-up of anticipation that you can only get when visiting a new city or country. What will the shops be like inside? Will I be able to buy a tacky souvenir to take home to my parents? All the vital questions that need answered. But before we could find that out we had to make it over the Border. Can you guess the kind that we got? As we got to the front of the queue a man who couldn’t have been more than 20 called us forward to the desk. Straight faced and very business-like, he went through the usual questions with all the personality of a robot. ‘Pleasure, well leisure, well it’s a holiday’ I replied, stumbling over my words. People who remind me of robots tend to make me nervous. You never know where there might be a Terminator hiding in plain sight. ‘How long are you planning to stay in the country?’ he asked. ‘One week’ I replied ‘but I’m sure we will want to stay longer than that, we are so excited to be here’ Husband nudged me to shut me up. ‘So, you are here on holiday. Are you staying in Calgary?’ He deadpanned. It was like having a conversation with a computer. ‘Well, we are spending a few days in Calgary and then planning to drive around for a bit and go to Vulcan and also Drumheller.’ I was babbling but I didn’t know when to stop. I was all ready to fish out our itinerary and give him a detailed breakdown of where we planned to go, what we planned to see and when we planned on going to bed. ‘Ummm….well, we hadn’t really planned on it’ I murmured. For the first time, he raised his head and fixed us with a steely glare. ‘You aren’t going to the mountains?’ he eyed us suspiciously. 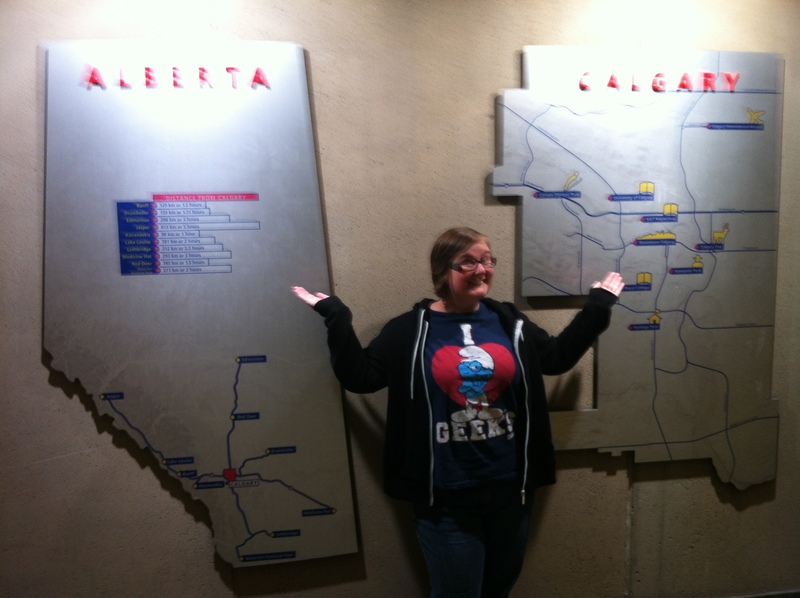 ‘Yes, well I’m writing a travel article on the geeky side of Alberta. So we are looking for sci-fi and fantasy links to the province. That’s why we are going to Vulcan’ At this point, and I swear I only did this because I was nervous and half expected armed guards to jump out and arrest us for not planning on seeing the Rockies, I raised my hand and gave him the Vulcan salute. I might have well have spat in his face from the disgusted look he gave us. 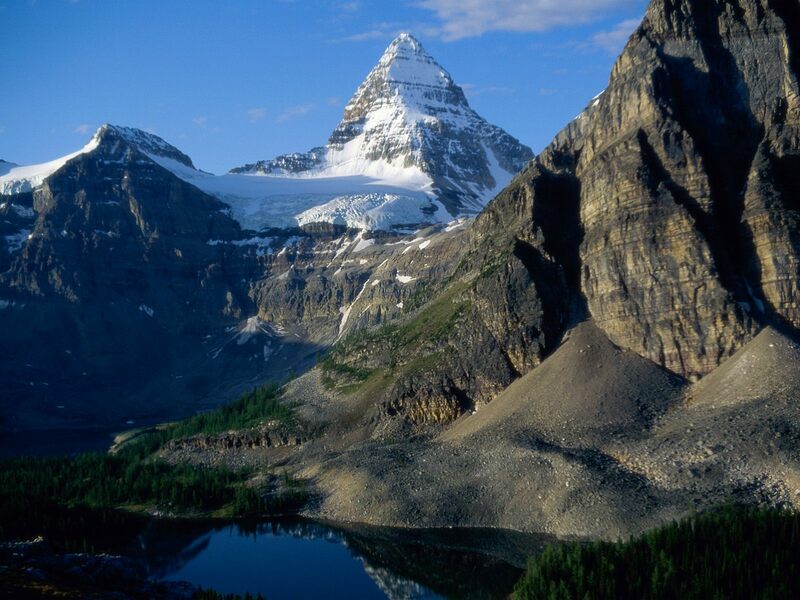 ‘90% of people that come to Alberta come to see the mountains. You would be missing out on a lot if you didn’t go and see them.’ He said this though gritted teeth and you could tell that he was resisting the urge to throw us in jail. Husband and I glanced at each other. This guy was serious, he wasn’t letting us past unless we agreed to check out the Rockies. We wandered away to the luggage carousel with the feeling that we had made a big mistake and insulted the very first Canadian we had met. ‘Maybe we should try and make time to check out the mountains’ I said to Husband. ‘Yeah, maybe we should’ he agreed. We stopped at the luggage carousel, feeling like we had just been Jedi mind-tricked.